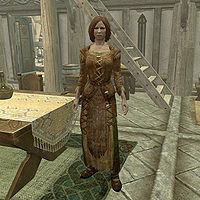 Oriella is a Nord bard who can be hired to stay in Heljarchen Hall. After being hired, she will introduce herself to you, saying, "Hello, my name is Oriella, the bard that you asked your steward to hire. I hope my music will be pleasing to you." Oriella wears farm clothes with a pair of boots. She wields an iron dagger in combat and carries a selection of common loot and gold. If you hire her before building the main room, she will spawn anyway and will be heard playing from the inaccessible room. This bug is fixed by version 1.1.0 of the Unofficial Hearthfire Patch. The dialogue option with your steward to hire Oriella may disappear if you purchase all other house improvements beforehand. This sometimes can be fixed by killing either your cow or horse, which will restore the dialogue option. Note, however this is ill-advised as in some cases it may cause you to lose the option to buy back one or both of the two. If all else fails, use console commands to spawn her directly. Here are the console commands: prid xx019633 (use the reference ID vice base ID); enable; moveto player. This may also occur if you have multiple Hearthfire homes and fired one of your bards (all the bards leave your service). Dialog option disappearance seems to occur when you purchased all the improvements. This page was last modified on 2 August 2014, at 20:48.